Microlit is proud to present the most advanced, state-of-the-art dispenser in the world: ULTIMUS. With this Bottle Top Dispenser, Microlit’s R&D has solved the biggest problem of users: Re-filling the bottle and rinsing the instrument WITHOUT the need to DISMOUNT it from the bottle. ULTIMUS is the First Ever Dispenser which offers four modes of dispensing: Dilution, Rinsing, Dual Liquid Handling and Re-circulation in a single unit. This introduces a new technology to the World. Currently, the ordinary Bottle-Top Dispensers available globally have a single inlet only from the bottle on which the instrument is mounted. ULTIMUS has dual inlet. This allows the flow of liquid from two separate sources independently. Standard Dispensing: In this mode, the dispenser dispenses the liquid into the receiver from the bottle it is mounted on. Purging: In this mode, the liquid is re-circulated into the same bottle on which the dispenser is mounted. This process removes air from the dispenser without wasting any reagent. Dilution/Rinsing/Second Liquid Dispensing: In this mode, the liquid from a second source can be dispensed into the receiver. The second liquid can be distilled water, thus allowing the user to rinse the instrument without dismounting it or dilute the reagent within the receiver. Bottle Refilling: In this mode, the liquid from a second source can be used to refill the bottle without dismounting the dispenser. Ordinary dispenser: For rinsing the instrument, the user has to dismount the instrument from the reagent bottle, re-mount it on the distilled water bottle, perform the rinsing and then again mount the instrument back on to the reagent bottle. ULTIMUS – Bottle Top Dispenser: The user can perform rinsing just by changing (opening/closing) knobs of the instrument which connect and disconnect the primary (reagent) bottle and secondary (distilled) bottle. No dismounting is needed. Ordinary dispenser: Till now dispensers were never used as an instrument for dilution or reagent mixing. If diluting a chemical/ reagent is required, then the user has to first dismount the instrument from the reagent bottle, re-mount it on the distilled water bottle, perform dilution and then again mount the instrument back on to the reagent bottle. Another way of doing it is by using two dispensers to mix the two reagents. 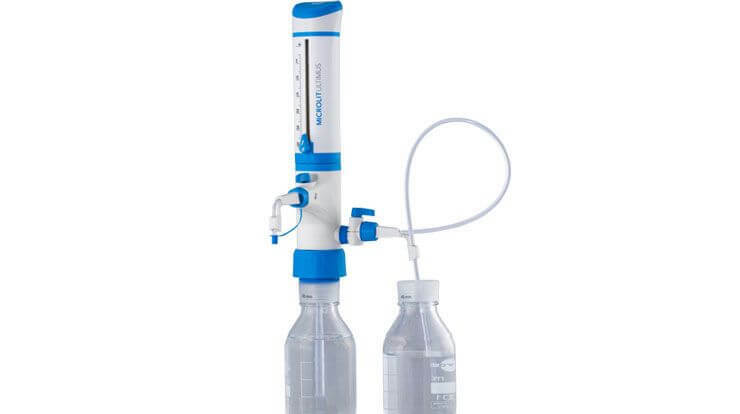 ULTIMUS – Bottle Top Dispenser: The user can perform dilution just by changing (opening/closing) knobs of the instrument which connect and disconnect the primary (reagent) bottle and secondary (distilled) bottle. In order to avoid damage to the instrument due to prolonged exposure to strong acids, all of the dispensers currently available in the market, require the user to dismount them daily. Extremely prolonged exposure of the acids to the dispenser can result in discolouration, functional problems and significantly reduced life of the dispensers. Ultimus eliminates this problem completely as the vapours/fumes of the reagent do not come in direct contact with the dispenser at all. The reagent is placed in the secondary bottle which is not mounted on the dispenser. Thereby, simplifying the life of the user who then does not have to go through the cumbersome & dangerous process of daily cleaning. In applications, which might require regular bottle refilling, the Microlit Ultimus provides the facility to have its second inlet constantly immersed in a bigger container for ease of use. Thereby, eliminating the need to remove the bottle from the dispenser every time its empty.